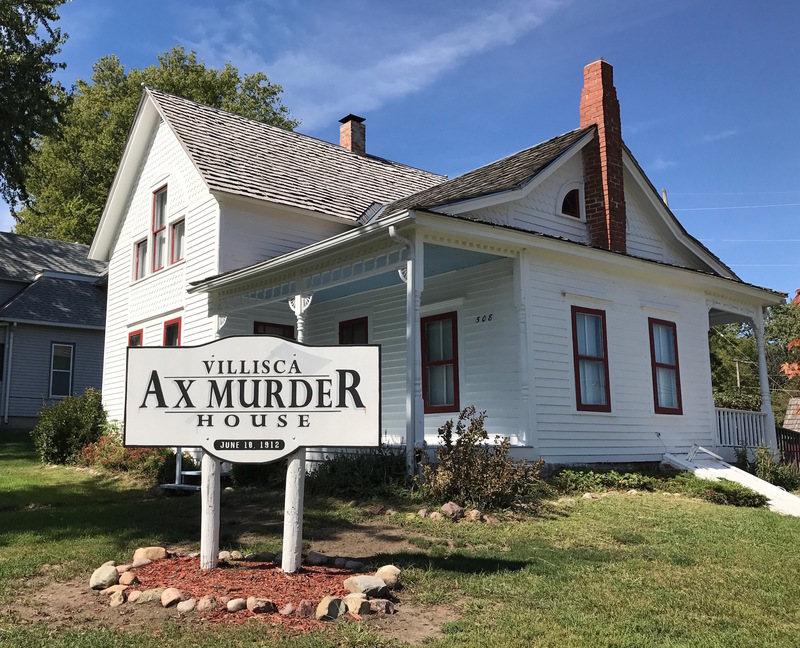 For some time, Christi and I had talked about going to visit the Villisca Ax Murder House in Villisca, Iowa. Since we were taking a meandering route back to Omaha and it was on our way, we decided to stop and see it. In 1994, Darwin and Martha Linn of Corning, Iowa bought the Moore family home and returned it to its original condition (without plumbing and electricity). It opened for tours and now attracts a lot of attention. A number of TV shows like “Ghost Adventures” have filmed episodes there and books have been written about the murders. You can even rent the entire house and stay overnight to see if any ghosts show up, but it will cost you $428. We chose the $10 daytime tour. 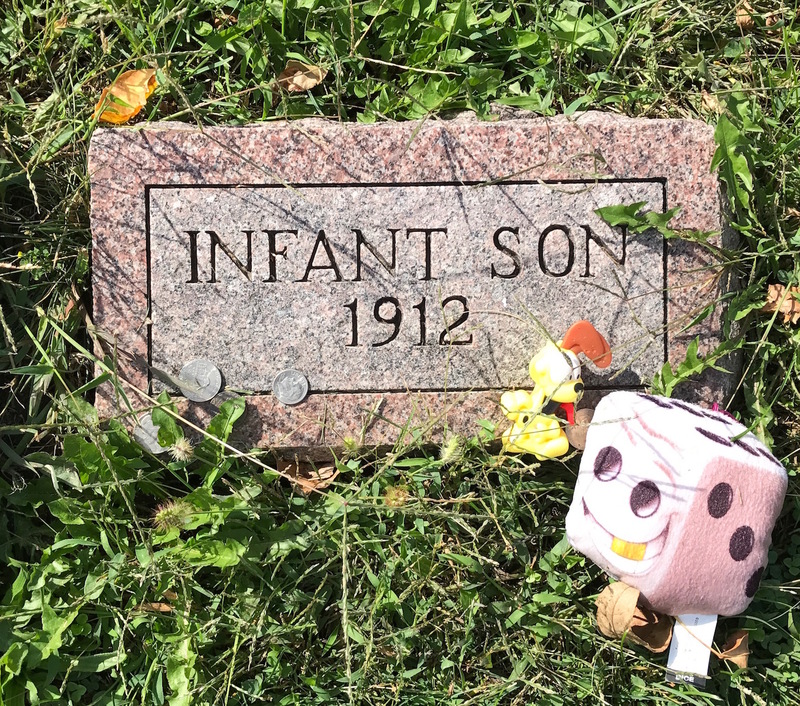 Tragedy struck the home of Josiah and Sarah Moore in Villisca, Iowa on the evening of June 9, 1912. 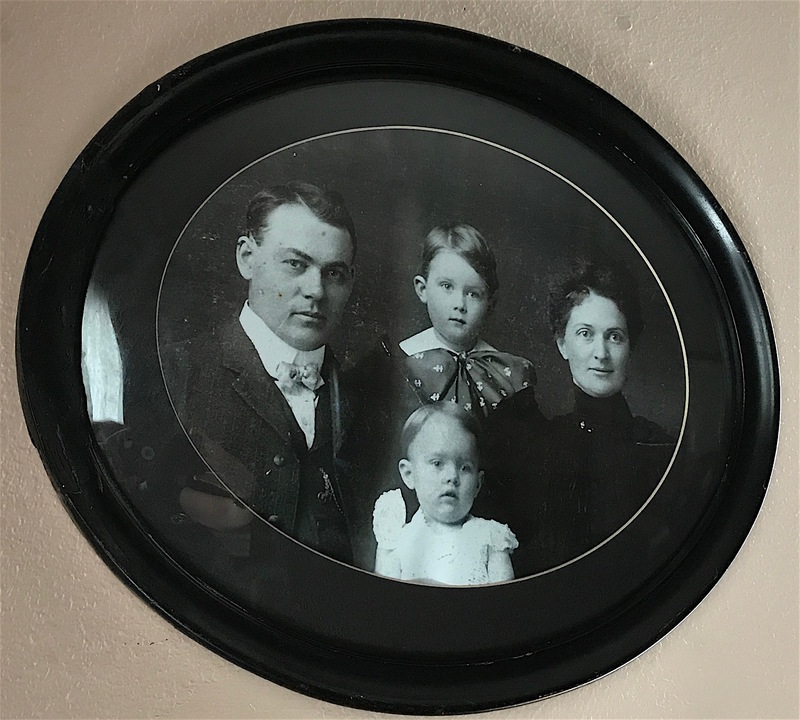 The Moore family consisted of father Josiah “Joe” (43), mother Sara (30), son Herman (11), daughter Katherine (10), son Boyd (7), and son Paul (5). Joe was born in 1868 and was a well-known businessman in town. A native of Illinois, he’d worked at the Jones Store in Villisca for several years before opening his own competing business. Born in Knox County, Ill. in 1873, Sarah’s family moved to Iowa around 1894. She and Joe married in 1899. On a Sunday evening, June 9, 1912, the Moore family went to the Presbyterian church to attend the Children’s Day program that Sara had helped organize. 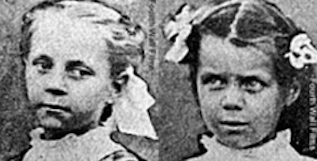 With them were sisters Lena (12) and Ina (8) Stillinger. Katherine invited both girls to spend the night at the Moore’s home after the program. When they returned to the Moore home, they all went to bed. Joe and Sara with son Herman and daughter Katherine when they were toddlers. The next morning, neighbor Mary Peckham noticed the Moore home was unusually quiet, with no outside chores taking place. After knocking on the front door and finding it locked, she contacted Joe’s brother, Ross. He found a key and entered the house, getting only as far as the spare bedroom on the first floor before immediately stepping back onto the porch. He asked Mrs. Peckham to call the sheriff at once. In the downstairs bedroom were the bodies of the Stillinger sisters. The Moore family was found in the upstairs bedrooms by city marshal Hank Horton. Everyone in the house was dead, their skulls crushed by an ax as they slept. Word of the murders spread fast in the small town and over the next hours, the crime scene was hopelessly compromised by gawkers walking through the house. The Villisca National Guard arrived around noon to secure the home. Back then, there was nothing like today’s crime team technicians to meticulously comb the area for clues or take DNA samples. Even the use of fingerprint evidence was in its infancy. 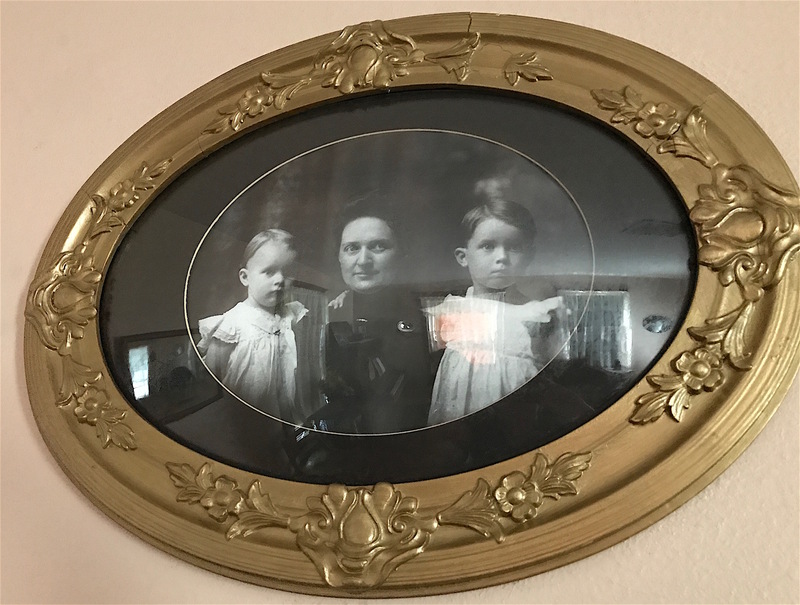 Sarah Moore with her two youngest children, Paul and Boyd. The facts are these. Eight people were bludgeoned to death, presumably with an ax left at the crime scene (found in the room where the Stillinger girls were). It belonged to Joe Moore. It is believed everyone was asleep at the time of the murders, with time of death shortly after midnight. Curtains were drawn on all of the windows in the house except two, which did not have curtains. Those windows were covered with clothing belonging to the Moores. Lena and Ina Stillinger spent the night at the Moore family home after the Children’s Day program at church. All of the victims’ faces were covered with bedclothes after they were killed. A kerosene lamp was found at the foot of the bed of Joe and Sarah and a similar lamp was found at the foot of the bed of the Stillinger girls. At some point, the killer(s) also took a two-pound slab of uncooked bacon from the icebox, wrapped it in a towel, and left it on the floor of the downstairs bedroom close to a short piece of key chain that did not belong to the Moores. A pan of bloody water was discovered on the kitchen table as well as a plate of uneaten food. The doors were all locked. 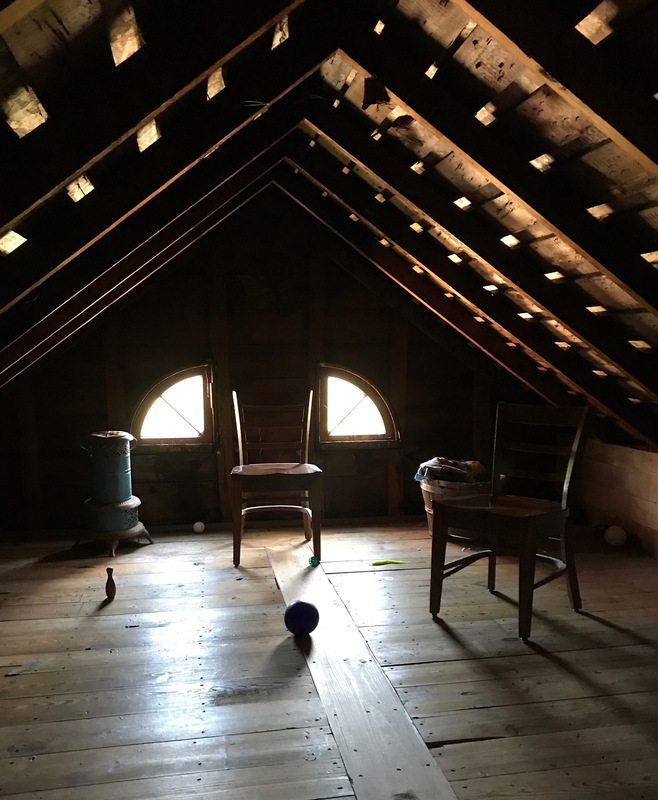 The Moore house’s attic is where police found two spent cigarettes, suggesting the killers hid there until the occupants had fallen asleep. The Moore-Stillinger funeral services were held in Villisca’s town square on June 12, 1912, with thousands in attendance. The funeral cortege was 50 carriages long. National Guardsmen blocked the street as a hearse moved toward the firehouse, where the eight victims lay. Their caskets were later carried on wagons to Villisca Cemetery for burial. A horse-drawn hearse brings the murder victims to the Villisca Cemetery. Several suspects were questioned and one man, traveling preacher Rev. George Kelly, supposedly confessed to the crimes. Rev. Kelly had attended the Children’s Day program that night and left town the very next day. He was tried twice for the crime. The first trial resulted in a hung jury and the second trial ended in an acquittal. The most notorious theory was that the murders were retaliation for Joe’s alleged affair with his former employer Frank Jones’s daughter-in-law Dona Jones. Formerly in the Iowa House of Representatives, Jones became a senator in 1913. Telephone operators claimed they’d overheard conversations between Joe and Dona arranging trysts. Joe had also taken the lucrative John Deere franchise with him when he opened his own business in Villisca in 1907. While never formally charged with any crime, Jones was the subject of a grand jury investigation and a campaign to prove his guilt impacted his political career. Many Villisca residents said they were convinced Jones used his considerable influence to have the case against him silenced. Many other theories are floating around about who did it and why. But in the end, nobody truly knows. The case has never been solved. 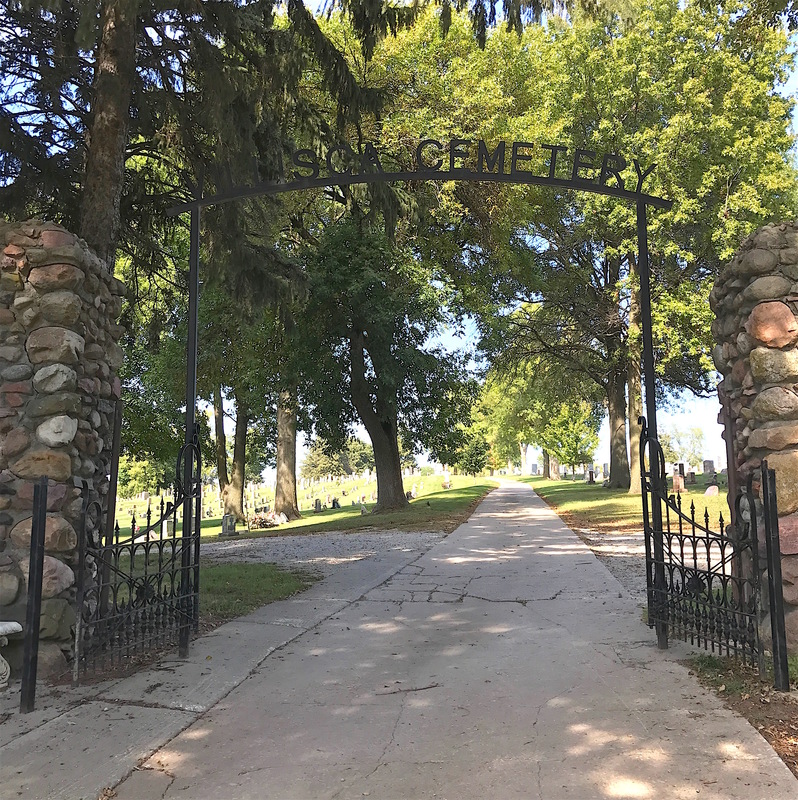 Villisca Cemetery has about 5,400 burials recorded on Find a Grave. 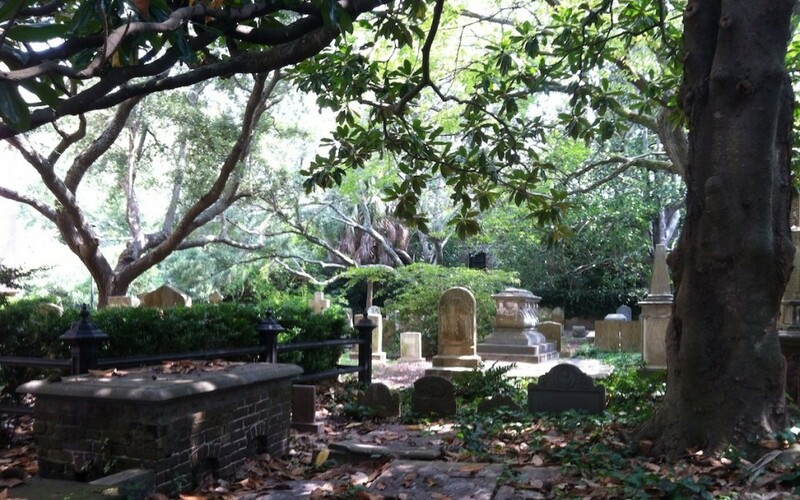 I could find next to nothing about the cemetery online but I believe burials may pre-date the 1850s. In case you’re wondering, I felt only sadness when we were in the house. I sensed nothing spooky or paranormal in nature. It was hard to believe that one day this happy family was going to church and by the next had been wiped out, including two little girls that would normally not have even been in the home. We headed to Villisca Cemetery after that, which has about 5,400 burials recorded on Find a Grave. It is well tended and on that sunny day, it was peaceful except for the birds. While there is a ton of information online about the Moore-Stillinger murders, I could find few details about the cemetery they are buried in. A very helpful directory/map is located outside the front gates to help visitors locate graves, which we appreciated. 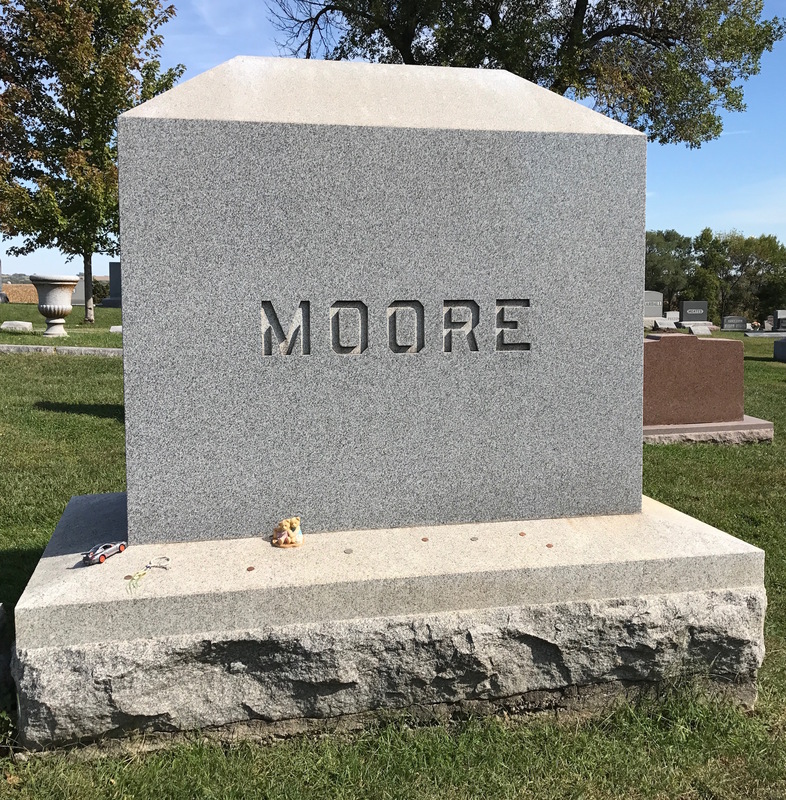 The Moore family has one large surname stone and then a long, low flat one beside it that lists all of their names and dates. Being so short, it was not easy for me to photograph it in a favorable way. Gravestones of the Moore family, with their names listed in order of age. 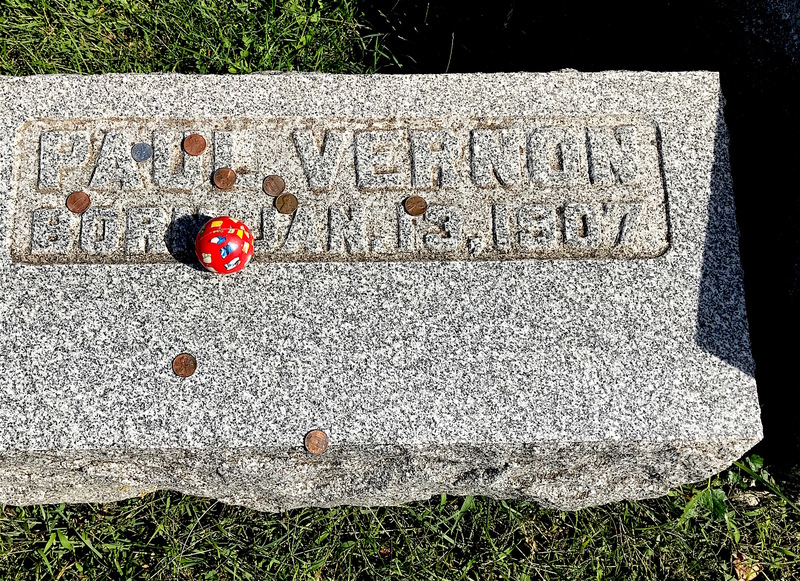 Visitors often leave coins, toy cars and other little items on the grave. I think the most poignant one has to be Paul’s on the end, who was only five when he was killed. Paul Moore was the youngest of the family, only five years old. Not far away is the Stillinger family plot. 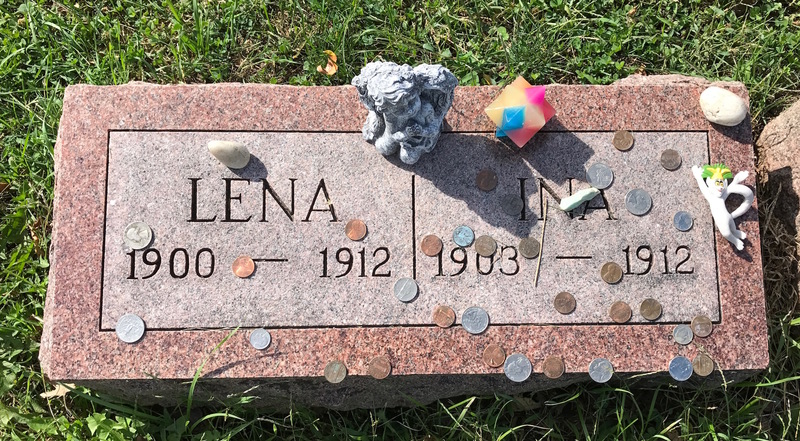 Lena and Ina share the same stone. It, too, is covered in coins and trinkets. Lena and Ina share a gravestone. It was there that I discovered a sad footnote to this story. At the time of the murders, Lena and Ina’s mother, Sarah Stillinger, was seven months pregnant. She gave birth to a stillborn son just a few days after the murders. To add to the family’s tragedy, their home burned to the ground in January 1913. One newspaper account claimed Sarah had died in the fire but that was untrue. She died in 1945. Husband Joseph died in 1946. They are buried beside their children. Sarah Stillinger, traumatized by the murders of her daughters, gave birth to a stillborn son a few days later. 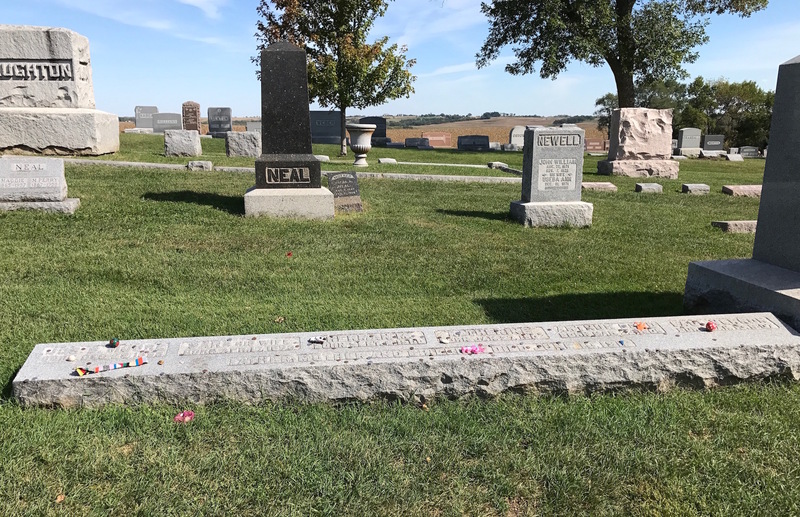 We lingered a little while at Villisca Cemetery before heading to T.J.’s Cafe on the town square for a late lunch. We were dining among people whose ancestors had quite possibly known the Moores and Stillingers. But for all its notoriety, Villisca is still a small farming community where people are raising their families and simply trying to get by. Just like the rest of us. I pray that it is never touched by a tragedy like this ever again. Wow, Traci, what a well written but horrible story for this family and this town. Hi, Bobbie! Yes, it was a terrible tragedy. I’m reading a book now that someone wrote that details who might have done it, a drifter who rode the trains and had killed others before this. Has a TV movie been made about this crime, Traci? Maybe the TV series, “America’s Most Wanted” back in the ’80’s or ’90’s did Might find something on YouTube about it? I’ll give it a try. Sad story … kind of like Truman Copote’s “In Cold Blood” novel in the 1960’s. Tom, I honestly don’t know. I’m thinking it might have been on “Unsolved Mysteries” because that would be right up that show’s alley. And yes, it did remind me of the Clutter murders, another horrific tragedy.